Sandy Lane Resort may be the perfect location for your upcoming nuptials! Located in the beautiful Algonquin Highlands on Halls Lake, your country wedding will be one to be remembered. Any season is the right season here at our cottage resort! 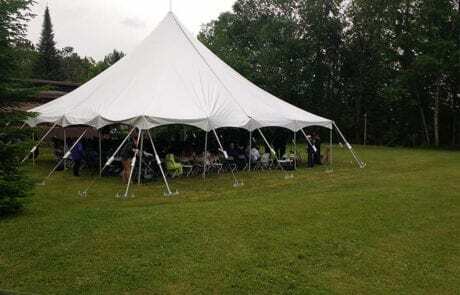 You can have your ceremony on the beach, under a marquee tent, or use the natural backdrop of the surrounding forest. 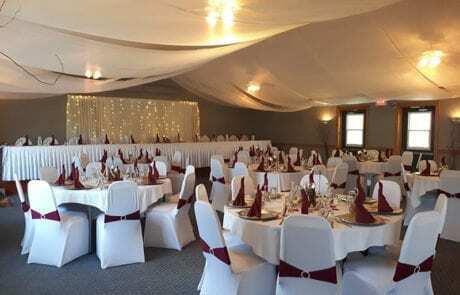 You can even have your ceremony elsewhere and hold your reception in our banquet hall. Sandy Lane Resort has a bright, air-conditioned and fully licensed banquet hall that will cater to all your needs! You can have the whole resort to yourself, allowing your guests to stay the night or for a whole weekend in one of our luxury on-site cottages. Sandy Lane gives you the flexibility of doing your wedding, your way! You and your wedding party will have the freedom to decorate and set up the banquet hall and property to your liking. Hire your own caterer or select one from our list of highly recommended, house favourites. When renting the whole resort you also have complete use of the entire grounds and facilities. That’s right! This includes the beach, the grounds and our banquet hall. Ask us for our 2019 wedding package for answers to all our frequently asked questions. Please get in touch to set up a consultation to view our property and discuss your big day and our wedding package options in further detail. The property is yours to be creative with, decorate or leave as is. Your guests will have full use of seasonal recreational equipment. A central bonfire pit is a great option for a fun Friday Night before the big day. Saturday morning guests can swim at the beautiful beach or perhaps rent one of our fishing boats for a morning out with the guys. Bring in a caterer of your choice or pick from our list of local caterers! Our banquet hall can seat up to 150 guests comfortably. Use our 60” round tables or 30” x 72” rectangular tables, or a combination of both. Our cottages can accommodate up to 118 guests using all beds and sofa beds. Cottages have separate bedrooms, one full size bathroom, complete kitchen facilities, a living room and dining area, as well as BBQ’s on all decks. All cottages feature a view of the lake. The beach is sandy and shallow, with a beautiful view of Halls Lake. There is also a grass area and beautiful mature trees along a forest line that is perfect for photo opportunities! Your guests have options! Guests can stay in one of our cottages on your wedding night or book the whole weekend at an affordable price. Guests also have use of our seasonal recreation equipment. We have canoes, kayaks, peddle boats and a playground for the summer season and skis, skates and toboggans for the winter season. Over 100 photos of past weddings and receptions!